A few months ago, I signed up to for May Flaum's Kit-tastic class at Big Picture Classes. I don't know why I didn't follow along when the class ran back in the fall but it was my loss. I learned a lot about matching papers to embellishments and things to look for when working on kits. I am also a big fan of Shimelle Laine's videos (as well as Glitter Girl at 2 Peas in a Bucket) which are loaded with tips and suggestions for matching up papers and page elements. Shimelle also hosts self-paced classes throughout the year. Right now, a re-run of Pretty Paper Party is about to start but I would recommend any of them. I have a couple of weekend crops coming up and thought I would give making my own kits a try. Here's the first kit. I am not sure who makes the paper below the wood grain. The chipboard embellishments, bird transparency, die cut cards are all My Minds Eye. 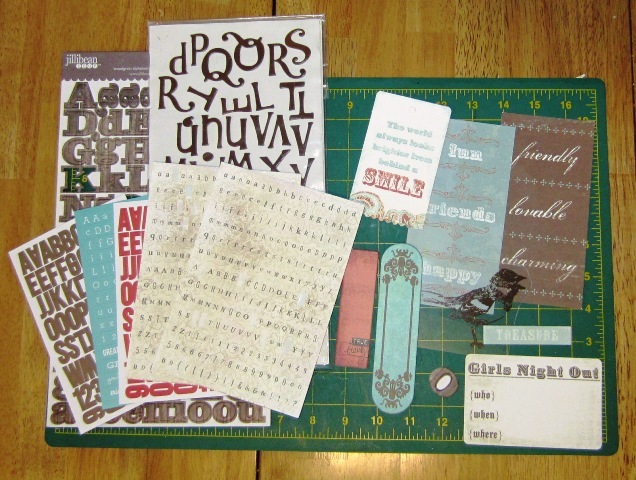 The chipboard letters are Jillibean Soup and American Craft thickers. The letter stickers are from Simple Stories and Making Memories. The inspiration for the kit was the blue and brown chipboard accent. It's been in my stash for years, like most of these items, and after May's class finally had the insight to match the kit to an embellishment instead of looking for embellishments to match a nearly completed layout. My usual M.O. Admittedly, this kit came together easily because it mostly contains My Minds Eye products and a fair share of them are from the same collection. 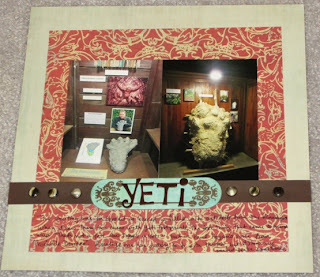 The pictures are from the queue for Expedition Everest at Disney World. It's a very simple layout with the inspiration chipboard element along with 3 different papers, some brads from my stash and brown Jewelry Box Thickers. 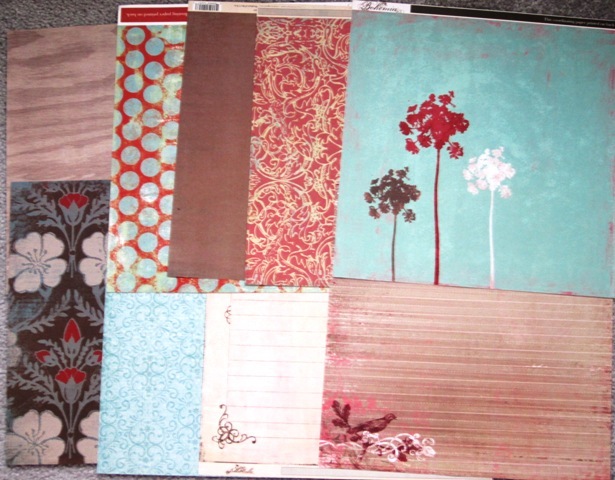 The background paper and the brown strip are the B-sides to the lined paper with the flourish in the corner and the blue paper with the large flowers respectively. This is a companion page to the other layout, actually it should be the other way around since this page will proceed the other in my album. I used the same red patterned paper and thickers which was paired with a tone on tone blue paper on top of a light brown cardstock. The embellishments are simple layered circles placed diagonally from each other. The top one includes a wood veneer butterfly with red pearls, placed with a phrase sticker from the Simple Stories letter sticker sheet. The bottom circle includes a Studio Calico butterfly with a red pearl and label sticker from Jillibean Soup. 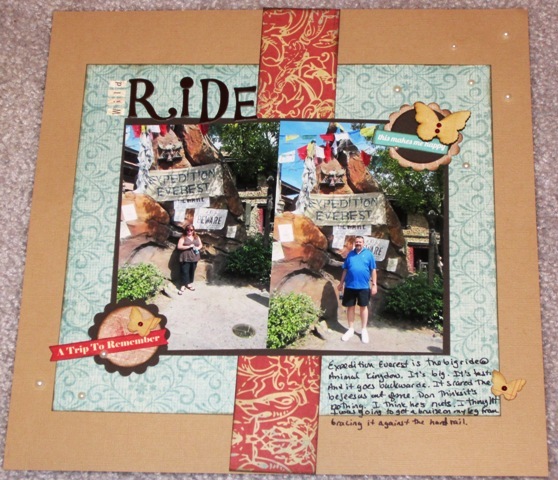 A third Studio Calico butterfly was placed by the journaling. 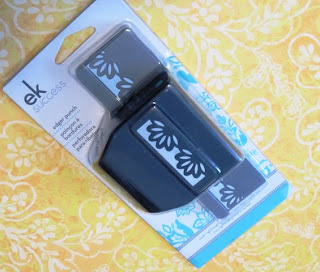 What better way to start the new scrapbooking year than with new scrapbooking supplies? First up are wood veneers from Freckled Fawn. I ordered the speech bubbles and arrows. The speech bubbles set has phrases such as: Hello, Swell, Wow, Epic and a few others. There are two of each phrase in a round, square or arrow shape. As you can see in the arrow pack, there are several styles to choose from. I have also added to my new border punch obsession. My latest acquisition is a flower border punch I picked up at Joann Fabrics last week.